Your good hands will maintain a straight line from elbow to “bit”. Gently shaking the tape is the mildest admonishment to the horse–”Are you listening? Get ready” or “steady”. A somewhat more vigorous shake of the tape is all you need to signal the horse to come back from walk to halt-”whoa.” As compared to the rein in hand transmitting a message through a bit to the horse’s mouth, it takes longer for the message to get from the riders hand to the horse’s nose when transmitted through the thirty foot length of longe tape and cavesson. Be patient, it is acceptable for the horse to respond slowly. Flipping the tape so that the cavesson comes down hard on the bridge of the horse’s nose is a severe punishment, equivalent to a jab in the mouth with the bit, reserved for interrupting a high spirited bucking spree, for example. 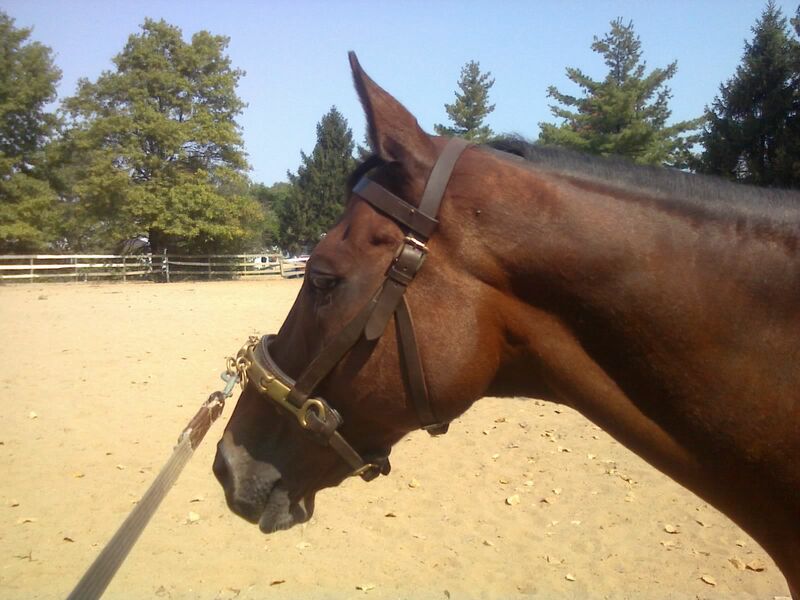 Using these “aids,” or “influences,” teach the horse voice commands. Take advantage of the corner of a paddock, ring or indoor hall to define the working area for the initial lessons to the horse. Say “walk,” then urge only as strongly with the whip as necessary to elicit the desired response. 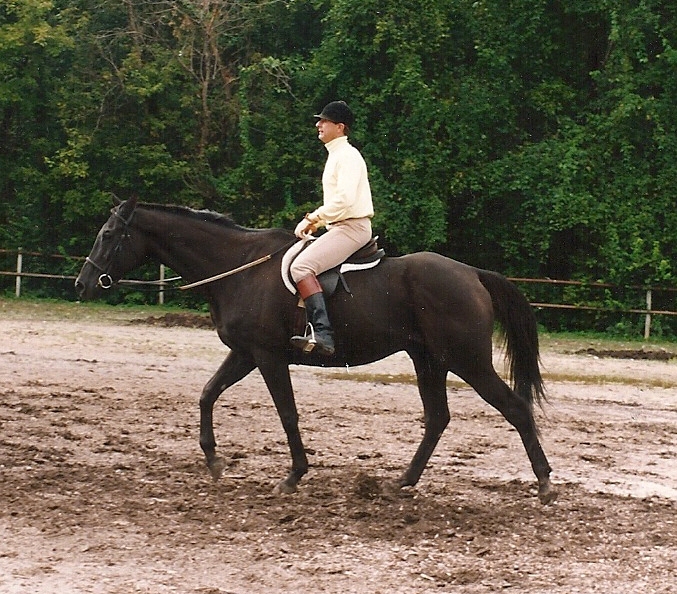 When the horse walks, reward with your voice-”good boy.” Let the horse walk long enough to reassure him that he is doing as you wish, then ask the horse to halt by saying “whoa,” followed by shaking the tape. With some horses, you may need to walk toward the horse’s head, to get it to halt, and “good boy.” In the first lessons you may play the tape out to only fifteen feet, but walk with the horse, inscribing with your own feet a circle of thirty feet or more, so that the horse is inscribing a circle of sixty feet or more. And circle both directions, i.e. to left and to right. 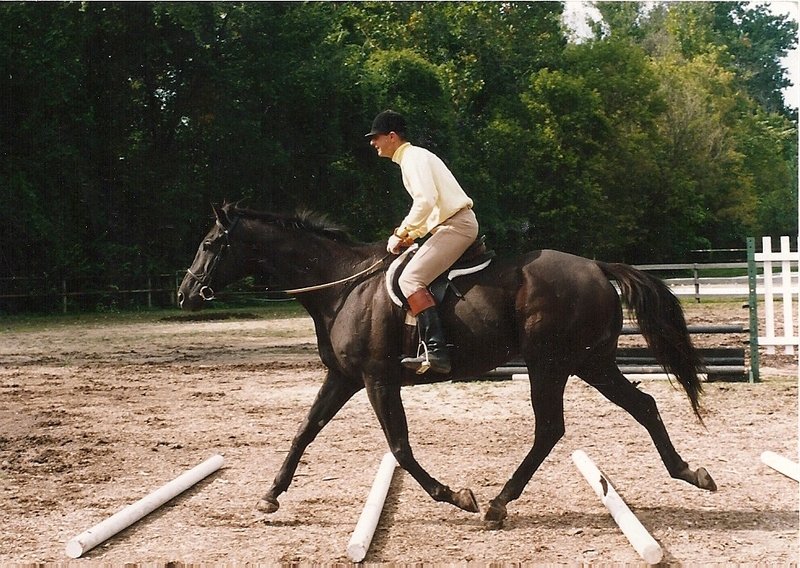 After a couple of lessons of “walk” and “whoa,” when you need no longer signal with whip or tape to get the desired response, add trot, playing the tape out further so that the diameter of the circle will not stress as yet undeveloped tendons, ligaments, and joints. This is done without drama, the horse appears to be, and is continuously comfortable. And although the footman may perspire, the horse should not sweat.